8 Rock Cave -- After getting the lantern from the desert dungeon, you'll want to go here to get a red key and attack powerup, before going back to finish the desert dungeon. 1. This is where you start the game. Kill the enemies to get a key and move on. 2. 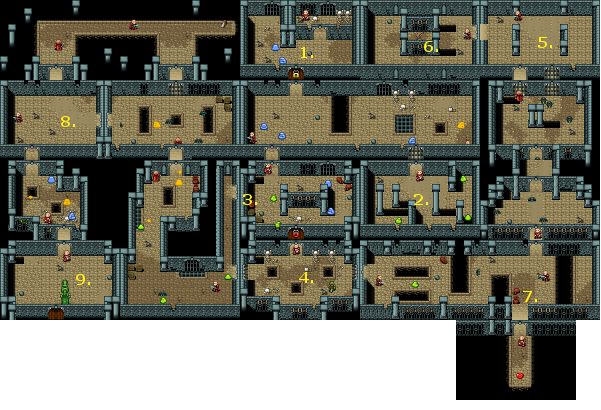 By killing all the green slimes in this room, you will earn a red key. 3. You can either use your red key to go south, or use the secret passage in the west wall to go around. 4. Here is the first real challenge of the game: the green toady. Attack him once when he's not moving, then dodge out of the way before he charges. Or get him trapped behind a pit, and thrash him. A life potion will be your reward. They aren't extremely common, so don't use it hastily. You can respawn from this room if you die. 5: Work your way here, and defeat another green toady to open the secret door. 6: A bow and some arrows are your reward. Now, enemies will occasionally drop more arrows for you. 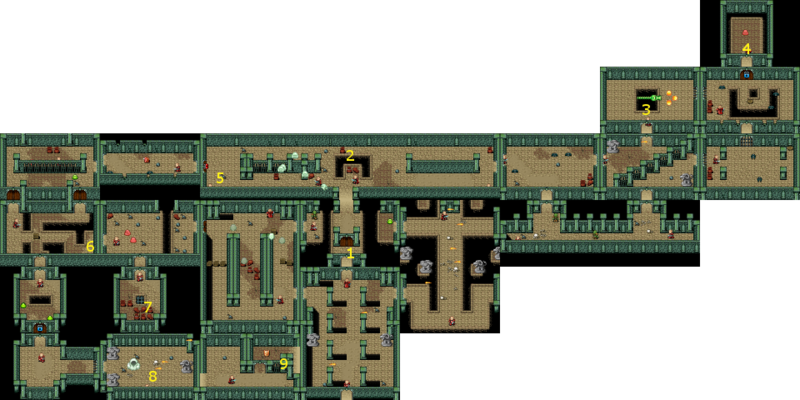 7: Now that you have the bow and arrow, kill all the enemies in this room (including the slime across the pit to the right that you couldn't reach before) to open the passage below and get a life powerup. 8: To get to the secret rooms north of here, follow the path on the floor and walk through the northern wall. 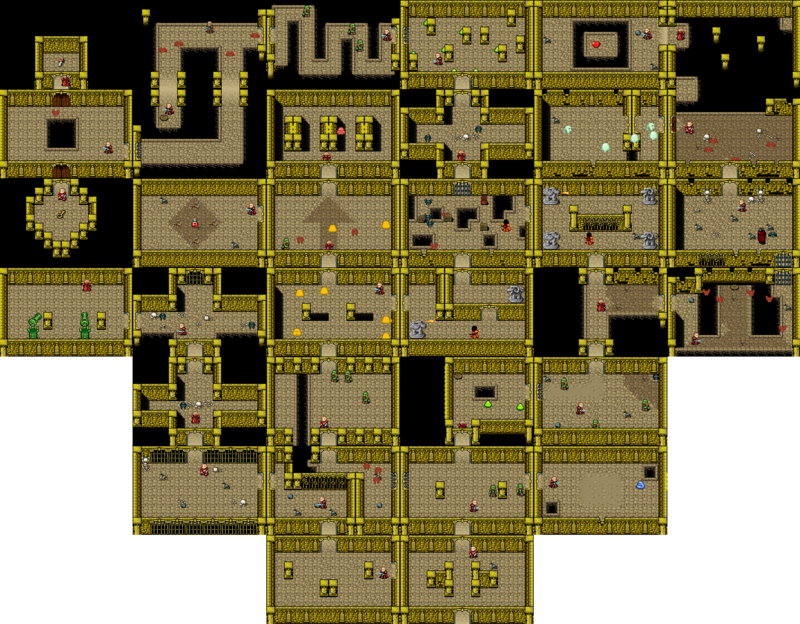 9: The boss of the prison dungeon is the FireCroc. He will be quite difficult if you haven't found the Bow and Arrow, and the attack powerup. Learn to dodge between his fireballs, and hit him between bursts. If you have arrows, it will be much easier to hit him from a distance. If you run out of arrows, go forward, hit him once or twice, then back up and be ready to dodge the fireballs again. Once he is dead, he will drop a yellow key, and the door will open to the overworld. 1. 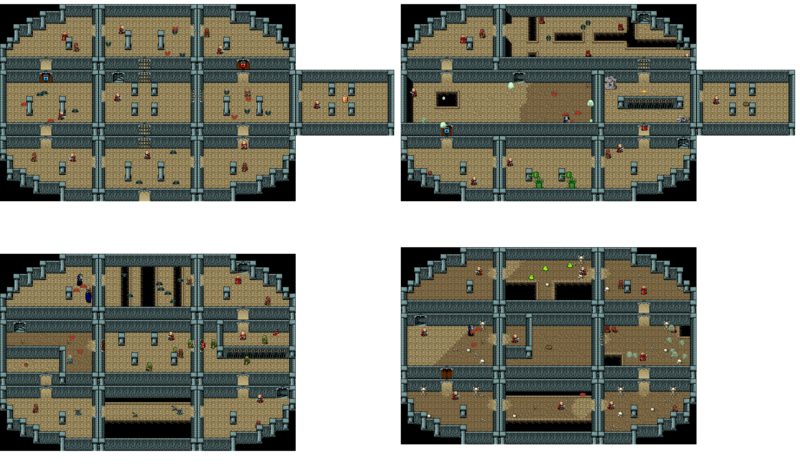 Start by working your way to the east and west edges of this room. When enemies on both sides are defeated, the door in the middle will open, and you can claim the attack powerup. 3. Work your way to the pit serpent, and defeat him by hiding on the edge, and hitting him after he comes out. You'll receive a blue key as a reward. 4. Defeat the red slime and all the slimes that spawn from him, and you'll find the lantern! 5: To open this door, you'll need a red key. If you don't have an extra, you can get one from the Rock Cave in the overworld. 8: To defeat the big ghost, hide in the lower-right hand side, dodge the fireballs, and attack when he is near you. Alternatively, if you've already purchased the dynamite, you can destroy the statues with the dynamite, making this a pretty easy fight. Grab the yellow key once you've defeated him. 9: Grab the armor powerup, and exit through the fake wall back to the starting room.